Option 1: Sell a Package! Your organization can receive deeply discounted packages that make it easy to get money back to your School or Charity. 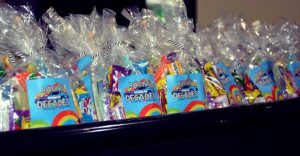 Our unique FUNdraising packages are currently available to public or private schools with 50 or more students, non-profit organizations, PTA, Sports Teams, or other not-for-profit groups interested in raising funds for their organization. We will consign or pre-sell you any amount of packages for a discounted price. You can then sell these to your family and friends at a premium and keep the difference for your organization. Some restrictions apply. One Attraction (Ropes Course, Bazooka Blast, Roller Skating or Race Session) plus a $10 Arcade Game Card – up to $30 value – for only $15 Each! 1. Start your Engines and Pick a Date! We offer special fundraising packages Monday through Thursday evenings, and will require advance notice. It may be best to consider multiple dates that will work for your group, as we only allow one fundraising group per night. Only authorized school personnel, or PTA/PTO representatives, or authorized representative from your organization can officially book events. Submit a request by contacting an event coordinator using our Contact a Planner link. Once you reserve your date, it is yours exclusively and no other organization will have the same date you will, although the track will remain open to the general public. Promote your Event: Create custom flyers you can print and post around your school, classrooms, multipurpose rooms, cafeterias, bulletin boards, employee break rooms, or wherever members of your school or group meets and can take a flyer. Be sure to include your school or organization name, date and time which you can reproduce to send home with students, staff, or volunteers one week prior to the event. We can also offer you a Custom embedded webpage with your school or organization name, date and time you can forward to your students, staff or volunteers. 4. Wave the Green Flag - Go,Go, Go! You can sit back and enjoy the FUN! 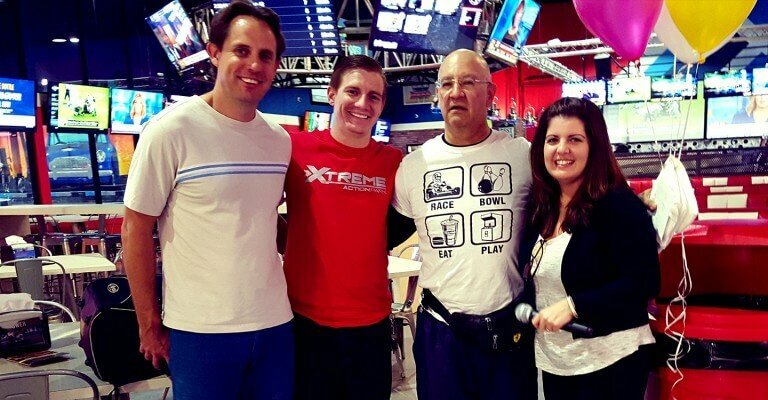 Xtreme Action Park will provide you with a private room to greet and mingle with your guests, students, their parents, clients, or supporters of your organization during your fundRACING event. Option 2: One Fun Night! Want something more simple? How about a watch party or get together for your sports team. Or a quick fundraiser for a school night event? Sign up for our FUNdraising nights where your school can receive 10% back! Simply call us to reserve a night at the park in your organization’s name. Then invite friends and family to meet you at the park. Everyone that mentions your organization’s name at any register, whether it’s food, ice cream or racing, and they receive 5% off PLUS we will give your organization 10%. Contact an Event Planner to check availability as we can only accommodate one school or group per night. Offer available Monday to Thursday. For large non-profits and those with corporate donors, we have a unique opportunity for you… Try out our Fund-RACING Team Racing Program! This program works much like a typical golf tournament but without the inclement weather. Perfect for large groups, we provide private track time and coordinate a team relay race. Race Details: Participants are grouped into to teams of 4 – 6 drivers, depending on the race length, and assigned to one race kart. We will allow up to 14 karts on the track at one time. Each team will designate a driver line up – who will be first in the kart to drive for the team. Then, they will determine how many laps each driver will race. This is where the fun comes in… When the first driver has completed their allotted race time, they pull into a “Hot Pit Lane” on our track and quickly jump out of the kart and the next driver jumps in – what a rush! This continues throughout the race until all drivers have had a turn. The last driver will get to cross the finish line. The first driver usually does the qualifying. All drivers encourage each other on the sidelines and communicate using dry erase boards and signals. Overall, it is an unbelievable experience and everyone has a great time! But how do you make money? Easy! Sell your teams. Offer Corporate donors a chance to sponsor a team by providing team shirts, turn signs, pit wall banners, sponsor logos and more! Name your race the “XXXX Challenge” or “100 Lap XXXX Endurance”. Offer custom trophies, medals and corporate sponsored prizes to the winners. Our event coordinators have all the tools you need to capitalize on all the opportunity we have available. Contact an Event Planner Today!